The joint venture between Eco Regions and Earthship for the development of Kenawa Island is creating Asia’s first branded Earthship Resort, namely a world-class off-grid eco-destination and unique location where self-sufficient sustainable buildings built in recycled materials and running on renewable resources will be available and for short and long-term stays. 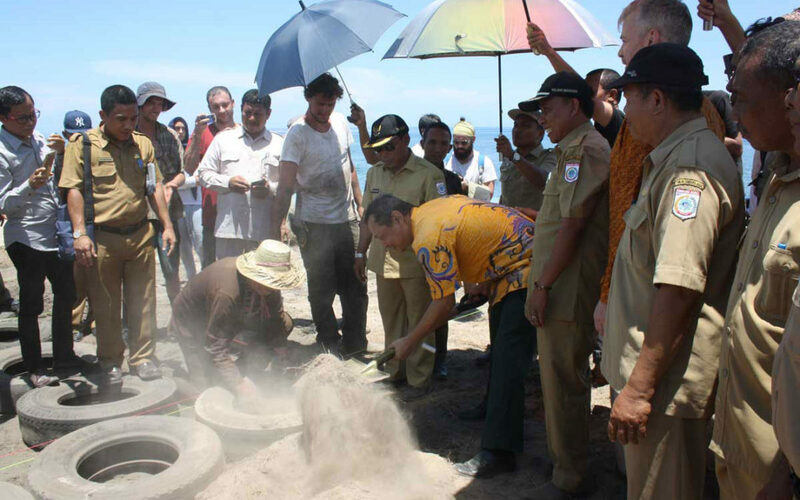 The project includes 44 Earthships, 11 Sumbawa stilt houses and a restaurant & spa, of which 33% will be built by Earthship and 67% by Eco Regions Indonesia. Asia’s first Earthship Academy will be created in Namo Island next to Kenawa and part of the eco-region. Imagine living in a house that takes care of your needs, providing you with water for your morning shower and with the right temperature to chill indoors without the necessity to turn on or even have an air-conditioning device. All this, right in front of the ocean, on a small tropical island surrounded by pristine waters teeming with marine life and a few minutes away from modern infrastructure. It sounds like a dream, but it is an accessible, sustainable, green dream you can fulfill. “This is Indonesia’s first Earthship” Architect Mike Reynolds, the Father of the Earthship movement said in occasion of the Earthship building workshop held in December 2016 in Kenawa. Since then, one more Earthship has been built in March 2017 and another workshop is planned for October 2017. “Indonesia is the perfect candidate to illustrate that you don’t need infrastructure.” he said. “Each unit on the islands will have their own infrastructure, responding to the environment and to the needs of who lives in it.” he added. Indeed, Indonesia’s peculiar geography represents a challenge for the construction and management of infrastructure; with over 18,000 islands, a standard system that connects all regions is not viable and the national electrification rate remains very low. “Indonesia has 40% of the world’s geothermal reserves.” Warnika Kardaya, Director General for Renewable Energy and Energy Conservation recently said. “This figure underestimates the potential of Indonesia’s geothermal power since it does not consider the offshore reserves, which account for about 70% of Indonesia’s territory. Indonesia is also rich in biomass, hydro, solar, tidal and wind energy. Therefore, we need to allocate and optimise our resources towards developing and harnessing these renewable sources” he added. The current government framework has increased the share of renewables to 23% by 2025 and more and more infrastructure projects are being developed to tap into Indonesia’s massive renewable energy potential. “I think real sustainability involves six aspects of humanity,” Reynolds said in an interview to the Jakarta Post: “First, humans need comfortable shelter that doesn’t use fuel. Then, we all need electricity and water, and all societies need to do something with sewage and the garbage they produce. Last but not least, everybody needs food. These, he said, are six things that all of humanity has to address to have a life today. The Earthship addresses all of these six things, all the time, all over the world.” Mike Reynolds has been building these passive, off-the-grid sustainable homes for almost 40 years worldwide, adapting their sustainable design and use to various weather conditions and contexts.